Vacation cabins don't usually have the luxury of five-star hotel spa tubs, unless you're the sort of person to build a small mansion and call it a cabin for the sake of irony and because it's made out of wood and surrounded by trees. In fact, more often than not, an actual cabin's bathroom is about half the size of the kitchen and only 3 feet deeper than the coat closet. So when things are small and cramped, how can you take steps to open them up a bit? If knocking down a few walls isn't a viable option, consider these ideas for expanding your cabin's tiny bathroom. 1. Go with light colors. Sure, the rustic hues of wood are wonderful for a cabin environment, but those warm tones can be a bit claustrophobic in a tiny bathroom. Paint your vanity an off-white or pale blue to make the room feel more expansive. 2. Be wise about storage. Whatever you decide to do with your bathroom accessories, don't let them clutter the space. Keep your floors clear to make the whole room feel more open. Consider keeping certain toiletries and amenities outside the bathroom itself, stored nearby in a linen closet or hallway chest of drawers. 3. Get good airflow. Small spaces mean there's not much air circulation, which is the last thing you want in any bathroom, but especially a busy one that's being shared by a crowd of people. Open windows, install a fan and do everything you need to defend against stagnant and unpleasant lingering odors. 4. Move the shower outside. While it won't get much use over the Christmas vacation retreat, this can be a huge space-saving step during the summer. When everyone's fresh from the beach or the lake and in need of a quick rinse, rather than queuing up for an eight-person line to the bathroom, an outdoor shower could be just the thing you need. It'll also cut down on mold- and mildew-fostering steam. 5. Move your toilet outside. 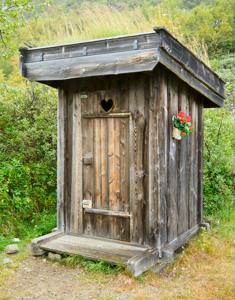 While the idea of an outhouse might elicit more than a few groans, the modern world is actually full of a number of functioning and not unpleasant outhouses. Provided you don't mind such immediate access to your septic tank, and you take the proper health and sanitary precautions, there's no reason why an outhouse shouldn't work for you and your family. Unless you find it gross.